At some point last year, I was talking with my mom on the phone on a day when I was trying to decide what kind of cookies to bake. Her first suggestion was White Chocolate and Macadamia Nut Cookies. I ended up not making them at the time, but I did stop to wonder: why haven’t I ever made those? Fast forward to a year later, and I knew exactly what kind of cookies to bake for my mom after she fell and broke her ankle. It’s a proven fact that cookies help with all recoveries, I think. I had a recipe from the December 2012 issue of Saveur for exactly this type of cookie. But, I couldn’t leave well enough alone. 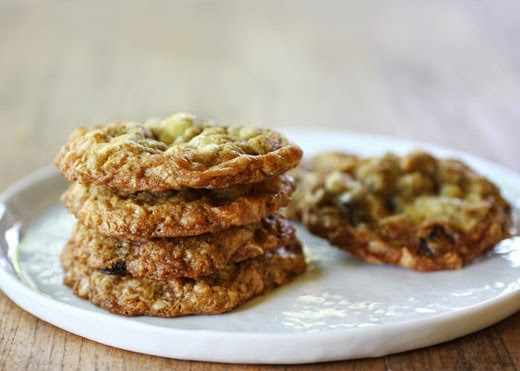 I wanted chunky cookies with oats in them and maybe some dried fruit as well. 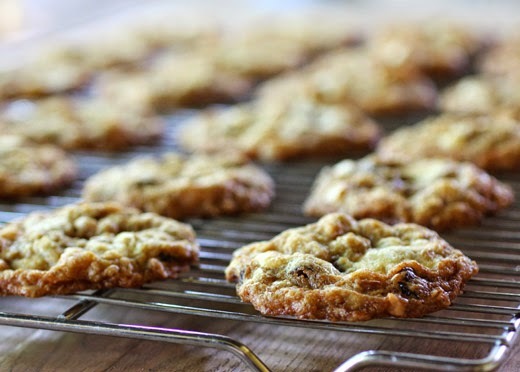 In Alice Medrich’s Chewy Gooey Crispy Crunchy Melt-in-Your-Mouth Cookies , there is a version with oats. However, in that recipe, the oats are chopped to bits in a food processor. I followed the recipe for quantities but stirred everything together by hand and kept the oats whole for maximum chunkiness. And, then I added dried sour cherries. The result was a dangerous thing. I like baking cookies to share, but I kind of wanted to keep all of these for myself. I started by roasting two cups of macadamia nuts. I sprinkled on sea salt, and it sticks to the nuts as the oils are released while roasting. They roasted at 350 degrees F for about eight minutes and then were coarsely chopped. This cookie dough is easy to stir together because melted butter is used. Two sticks, or 16 tablespoons, of butter was melted and set aside. One and a half cups of flour were sifted with a teaspoon of baking soda and a half teaspoon of salt. One and a half cups of oats were added to the flour mixture. In a separate bowl, the melted butter was combined with two-thirds cup of granulated sugar, two-thirds cup of brown sugar, and two teaspoons of vanilla extract. The flour mixture was added to the egg mixture and was stirred to combine. 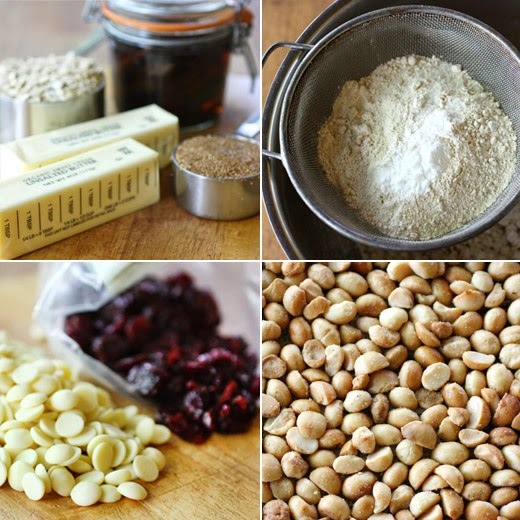 The chopped nuts, two cups of white chocolate chips, and two cups of dried sour cherries were added to the dough. Then, the dough was refrigerated for a couple of hours. Because of the melted butter in the dough, it needs some chilling time before baking. Heaping tablespoons of dough were baked on sheets at 325 degrees F for about 15 minutes, and sheet pans were rotated halfway through baking. These were indeed chunky cookies just as I’d hoped, and they were packed with great flavors. The salted, buttery macadamia nuts contrasted with the sweetness of the white chocolate, and the chewy pieces of dried sour cherries were a nice fruity addition. I can’t prove they’ll help Mom’s ankle heal faster, but cookies are always good medicine. Lisa, everything about your cookies speaks to me! The creaminess of the white chocolate, the buttery crunch of the macademias, tang of the dried cherries and then the oats to bring it all together. Yes! Ha! You know I'll send you cookies! One of my fav kind of cookies! Oh gosh I hope your mom recovers quickly! And yes I'm absolutely sure these will help speed the process along. I am such a sucker for dried cherries in sweets but these look particularly amazing. They look so good! Thank you so much for sharing. White chocolate and the king of nuts...a perfect combo. These cookies look divine, Lisa. Cookies really are a magical cure, aren't they? And your mom must be well on the road to recovery after sampling these! These are so lovely looking -- thanks. macadamia nuts are SO good and must inevitably help improve a person's spirits in all situations. great cookies! Indeed, macadamia nuts should be great in these cookies. These look delicious indeed, Lisa! Macadamia nuts are one of nature's great treasures. Wishing a speedy recovery to your Mom! I love oatmeal cookies and yours are loaded with so many goodies. They must be irresistible. Been there, done that with the ankle...tell your mom I sympathize. Sending her good wishes for a speedy recovery. These cookies (if you didn't keep them all :) ) will definitely improve her state of mind. They look delicious...I do love Alice Medrich. These are a delightful cookie. The thought of a tall glass of cold milk or a good cup of coffee, to enjoy with them is divine. These cookies are perfection! A terrific combination of flavors. Looks delicious !!! I love these cookies !